Popradské pleso in Tatra National Park, Slovakia. This is a list of the number of national parks per nation, as defined by the International Union for Conservation of Nature. Nearly 100 countries around the world have lands classified as a national park by this definition. Note that this article links to list articles of national parks by country on Wikipedia in the "Country" column in the tables. 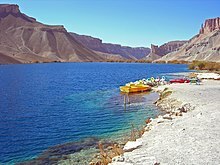 Lake Band-e-Amir the national park of Afghanistan. Iguazu Falls, is located on both Iguazú National Park, Argentina, and Iguaçu National Park, Brazil it is one of the Seven Natural Wonders of the World. Twelve Apostles in Port Campbell National Park. Victoria, Australia. ^ Refers to mainland Denmark only (part in Europe). 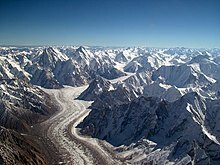 For Greenland, see Northeast Greenland National Park, Greenland's only national park, which was established in 1974 and is the world's largest at 971,000 km² (44.8% of Greenland's area). ^ Includes overseas departments (outside Europe) where there are three national parks: the 33,900 km² Guiana Amazonian Park in French Guiana, 1,054 km² Réunion National Park in Réunion and 173 km² Guadeloupe National Park in Guadeloupe. ^ "National Parks - Visit Laos". Visitlaos.org. Retrieved 5 February 2019. ^ Whitten, T. (28 April 2009). "Mongolia: tough decisions about the world's oldest nature reserve". The World Bank. Retrieved 21 December 2017. ^ "e-나라지표 국립공원현황". Statistics Korea. Retrieved 5 February 2019. ^ "Sistema de Información de Biodiversidad - Áreas Protegidas" (in Spanish). Retrieved 11 July 2017. ^ "Federal conservation units of Brasil". Retrieved September 25, 2012. ^ "Áreas Silvestres Protegidas del Paraguay. SINASIP" (PDF). Awsassets.panda.org. Retrieved 5 February 2019.